Tessa Thompson and Chris Hemsworth proved they could save the world - and make us laugh at the same time - with their performances in Marvel's Thor: Ragnarok. We'll soon see them back together again Men in Black: International, and their reunion was not an accident. "We just had such a great time on that film,” Hemsworth tells our sister publication Total Film magazine. "So when Tessa’s name was in the mix, [for Men in Black International] it was like, ‘Aw, yeah – we can pick up where we left off. This will be easy.'" The feeling was mutual. "Chris was like, ‘Hey, legend, are we going to rock this?’" says Thompson. 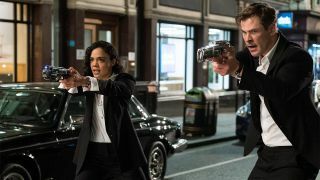 "And I was like, 'Yeah, we’re gonna!’"
Thompson plays Agent M, a new recruit who is paired up with Hemsworth's Agent H. The suited and booted team then travel around the globe - with stops in London, Marrakech, Ischia and Paris - to avert disaster and help uncover a mole in the Men in Black organization. “When I was cast, [people] were like, ‘MEN In Black? How do you reconcile that?’ The truth is, there’s always been really great women in these movies. It’s a continuation," says Thompson. If anything Thompson is just what the series needs, after all the original did come out in - brace yourself - 1997. "There are challenges inherent in making it really fresh, new and original," she admits. "We have such a great foundation there... we just have to not screw it up," adds Hemsworth. On shelves from today, the new issue of Total Film also features Shazam, Alita: Battle Angel, The Lego Movie 2, The Punisher season 2, Star Trek Discovery season 2, plus interviews with Saoirse Ronan, Margot Robbie, Steve Carell, Armie Hammer, and many more. Want Total Film magazine arriving through your letterbox every month in 2019? Right now you can subscribe for just £17.50 and get a free Marty McFly Playmobil collectible from Funko and an ’80s movie bookazine. Head to My Favourite Magazines now to take advantage of the offer. (Ts and Cs apply). Subscribe to Total Film magazine now and you’ll never miss an issue (as well as saving money on the cover price). Get the digital version for your tablet or have an exclusive subs cover through your door every month - or save even more with a print/digital bundle! Grab your first issue FREE direct from Apple Newsstand. Or read our Android version on Google Play.